On the surface, Buffalo's decision to use the popular alternative DD-WRT firmware on its wireless routers might sound like a stroke of genius. Since enough people like to flash their routers with alternative distros that Cisco and NETGEAR sell routers specifically for them, why not just save a step and make routers with it pre-installed? Since DD-WRT is installed by default (DD-WRT v24SP2-MULTI (12/17/10) std - build 15940 on the test sample), that's how I started to test the router. I got through the router tests and all the way through the 20 MHz mode wireless tests on both bands. But when I tried to test wireless performance using 40 MHz channel bandwidth, I ran into a problem. Basically, I could not get the router to stay in 40 MHz bandwidth mode. I tried multiple clients, reboots and power cycles. And I lost track of the number of times I used the confusing and poorly documented DD-WRT GUI to set the router to 40 MHz bandwidth mode. Sometimes it would take, but then revert back on its own to 20 MHz mode. More often, the settings page would reflect what I programmed, but the Status > Wireless page would show a different story (as would my test client). Keep in mind that I test in a pristine wireless environment, with no other networks anywhere in range. So that rules out the possibility of an automatic backoff to neighor-friendly 20 MHz mode due to neighboring network detection. I consulted with Buffalo and tried various things they suggested. But in the end, there was no way I could get the router to stay in 40 MHz bandwidth mode. As a last resort, I flashed the router with Buffalo's "User Friendly" firmware, and BAM, problem solved. So, while I'll briefly mention some of the features available with DD-WRT, this review will reflect the router's features and performance based on Buffalo's "User Friendly" firmware load. You might mistake the AG300H for its single-band WZR-HP-G300NH sibling. Both have a glossy black case that's intended to assume a vertical orientation using the supplied snap-on base. But it also can lay horizontally on a table top, with the base moving along to keep the router from rocking on its gently curved sides (and raise it up for good airflow). The front panel indicators and controls are shown in Figure 1. The AOSS button (Buffalo's automatic wireless security setup method that pre-dated Wi-Fi Protected Setup (WPS) will also initiate a WPS pushbutton session. The rear panel callout diagram in Figure 2 shows the Gigabit Ethernet WAN and four switched LAN ports and USB 2.0 port for storage, but not printer, sharing. Contrary to what you might intuitively think, the Off positon on the Router switch does not turn off router power. 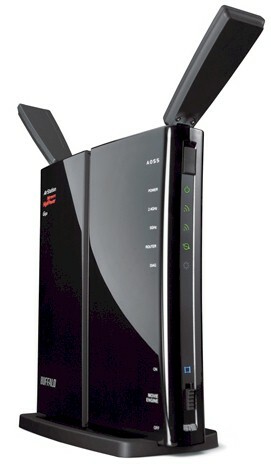 Instead, it switches it to access point mode, turning all ports into LAN ports. The Auto position makes the switch automatically, depending on whether an Ethernet link is detected on the WAN port. The inside shot from the FCC ID docs is with the RF shields removed so that we can see the Atheros-based design. An Atheros AR7161 SoC @ 680 MHz with 128 MB of RAM and 32 MB of flash is at the heart. An Atheros AR9223 11n single-band 2x2 MIMO transceiver provides the 2.4 GHz radio while an Atheros AR9220 11n dual-band 2x2 MIMO takes on 5 GHz band duties.